I've always been a big reader, and mentioning the Sweet Valley High series in a post recently made me start thinking about some of my other favorite books when I was younger. Of course I was -- along with most other girls my age -- a big fan of the Nancy Drew series and all of Beverly Cleary's Ramona Quimby books ... and I was also addicted to Judy Blume, from Are You There God? It's Me, Margaret, to Blubber, to the controversial-with-middle-school-students'-moms Forever. But there were two that totally jump-started my imagination at two different ages. 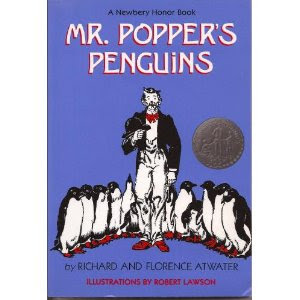 One was Mr. Popper's Penguins , by Richard and Florence Atwater. From Amazon.com: Poor Mr. Popper isn't exactly unhappy; he just wishes he had seen something of the world before meeting Mrs. Popper and settling down. Most of all, he wishes he had seen the Poles, and spends his spare time between house-painting jobs reading all about polar explorations. Admiral Drake, in response to Mr. Popper's fan letter, sends him a penguin; life at 432 Proudfoot Avenue is never the same again. From one penguin living in the icebox, the Popper family grows to include 12 penguins, all of whom must be fed. Thus is born "Popper's Performing Penguins, First Time on Any Stage, Direct from the South Pole." Their adventures while on tour are hilarious, with numerous slapstick moments as the penguins disrupt other acts and invade hotels. This book was a huge favorite of mine in elementary school, mainly because I imagined moving penguins into our home, too. I imagined taking a garden hose, turning it on and spraying it down our basement stairs, then somehow freezing it so that we'd have the perfect environment for penguins down there. I spent more time thinking about that than was probably healthy. Thought about it last week, as a matter of fact. The other book that completely fascinated me was From the Mixed-up Files of Mrs. 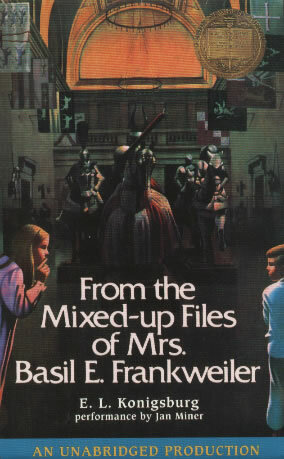 Basil E. Frankweiler , by E.L. Konigsburg. In this book, Claudia and her younger brother Jamie hide out in the Metropolitan Museum of Art overnight and have countless adventures while they're there. I'm thinking about adding each of these books to Nathaniel's Amazon wish list, because even though they're for kids slightly older than he, he's reading way ahead of his age. I hope he enjoys them as much as I did! We are reading How to Eat Fried Worms at bedtime. Although my son could easily read it on his own, I enjoy sharing some of my favorites this way (dare I say, classics?). I think we might have to select something a bit more feminine next time, but my daughter is sticking with us through HTEFW. I'm thinking a Ramona book is next. The two you mentioned also sound like good books to add to our list! I can't wait to see the Ramona movie, I loved those books! Hi! I popped in via your comment at Soft Place to Land. I'm trying very hard to limit my computer time, so I didn't stay long, but I will be back. Your "Books..." post struck a chord with me. I too, love both of those books. My teacher read the Mixed Up Files aloud to us in fifth grade. I, loved it so much that I have read it aloud to my kids. Mr. Popper, however, I met along with my children as we read the book aloud. My youngest son loved it so much that he can't wait until he is able to read it again himself. I would recommend reading these aloud with your children if at all possible. Sweet times. I look forward to visiting your blog and reading more! It looks lovely. I'm a huge reader too! Always have been. Don't have quite the time that I wish to read. My husband asked if I want a Kindle for my birthday. We read Mr. Popper to our kids about 2 years ago. My son cried when we were done and had to return it to the library. (I cried when we finished reading Charlotte's Web-another good one). So I bought him his own book and he was so excited. My mom used to read us the Laura Ingalls Wilder books. Love those books too. And I could go on and on. Charlotte's Web is my all-time favorite children's book, but I also loved Island of the Blue Dolphins by Scott O'Dell, Tuck Everlasting by Natalie Babbitt, the Boxcar Children series, and all the Ramona books. My 4th grade English teacher read aloud Charlotte's Web after lunch, and there was something about having a classic story read aloud to you to really make the story come to life. To this day, I credit Mrs. Figh for bringing that book to life for me, and it's still a book that I cherish. Ryan Leigh, I've never heard of that book! But I have to say, it sounds like one my boys might like. I'll put it on our list! Lazy, we do read aloud to the kids, but they also love to read on their own! I keep the more "complicated" books to read to them aloud, such as The Chronicles of Narnia, which have a lot of British and old-world phrases in them. But reading time is indeed sacred around here! Grape, I loved the Laura Ingalls Wilder books when I was young, too ... do you think they'd appeal to boys as much as to girls? I can't remember the stories well enough to know.